Ever since this incarnation of the Caped Crusader won fans over in Batman v. Superman: Dawn of Justice, the question of what villain Batman will fight in his upcoming solo film has been prevalent. While Dawn of Justice itself wasn't the best, Batman was undoubtedly the best part of it, and fans have been waiting to hear news about the solo film, being written and directed by Ben Affleck himself. But regardless of story or supporting characters or anything like that, people have wanted to know who Batman will be facing. And now, Affleck may have added some fuel to conversation, with a possible candidate. 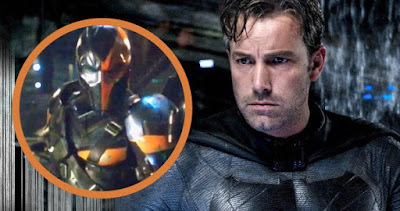 Affleck posted on his social media accounts a video of a man dressed as the DC villain Deathstroke. The video is featured above which you can view for yourself. It shows Deathstroke walking around, and the camera pulls out revealing the video to be on a camera monitor, displaying what is being filmed on set. This adds a lot of question as to where Deathstroke will be used. Right now, Affleck is filming Justice League, so many news sites have run with the story that Deathstroke will be in that movie. But we don't know for sure. This could very well just be test footage for the solo Batman movie. First, I just want to say that I think Deathstroke is a great character, and would be a good fit for the universe regardless of what film he is in. Secondly, I'm not positive this is even real. If Affleck had not released this himself, I would have said this is undoubtedly fake. However, he did release it, but I still have a funny feeling about this. I don't know why it would be fake, but something doesn't sit right with me. The costume design may just too on the nose, too close to the comic for it to actually be real. But regardless of its validity, I want Deathstroke to be apart of this universe, and I think we will be hearing more about this very, very soon. What do you think? What are your thoughts on the footage? Is this official confirmation that Deathstroke is in the DC Cinematic Universe? Will he be in the solo Batman movie, or Justice League? Could this be fake? Who do you think is playing the character? Leave your thoughts in the comments section below.